Formula One world champion Jenson Button has set his sights on the successful defence of his title, but remains less certain about his path back to the winner's podium after a disappointing season opener. Despite feeling "completely at home" with McLaren and fellow world champion Lewis Hamilton, the British driver said his new team would still be playing catch-up at the Australian Grand Prix this weekend. 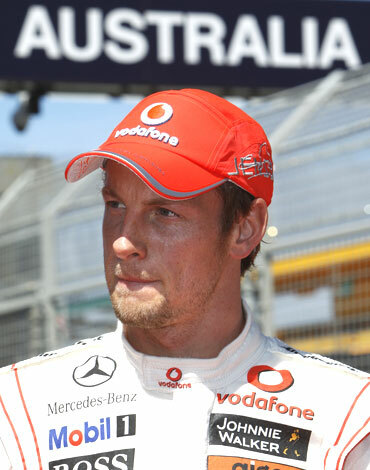 "I think Red Bulls are very strong, I think the Ferraris are very strong, and then it's probably us," Button, champion with Brawn GP, now Mercedes, said in a track-side interview at the Albert Park street circuit on Tuesday. "But I'm hoping with the circuit change and a few little updates we'll be closer to them and maybe challenging them here." Button started eighth and finished seventh in a frustrating race in the season opener in Bahrain on March 14, reeling in Red Bull's Mark Webber but ultimately being shut out by Mercedes' seven times world champion Michael Schumacher who finished sixth. 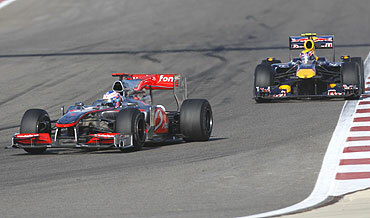 Team-mate and 2008 champion Hamilton finished third behind a Ferrari one-two after Red Bull's Sebastian Vettel suffered an engine problem to drop from first to fourth. "The first race for us was difficult. 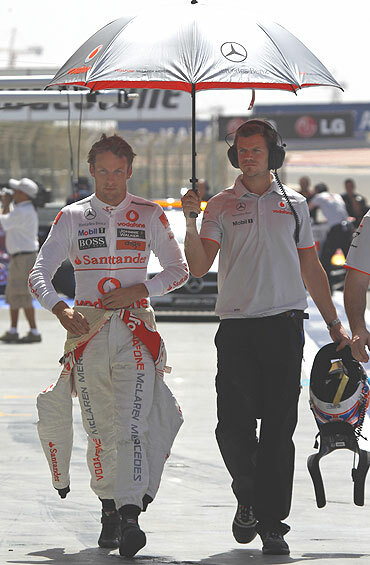 I don't think the car suited Bahrain too well," said Button. "I think it will suit this circuit better. It's a lower downforce circuit so we have to wait and see. "A podium would be fantastic here (in Melbourne). I think that has to be the aim. I think it's a possibility and you've got to set your sights pretty high." Despite concerns over McLaren's pace in Bahrain - Button has taken some comfort in his return to Albert Park, where he won from pole last year on the way to six victories in seven starts that ultimately led to the title. "It's great coming back here, because this is all where it started last season. This is where my first pole of the season was and my first win. "So it was a very emotional moment last year and hopefully we can have something similar this year. "It's going to be a very competitive season, but the aim has to be - to be world champion. "I need to be in a position that I have a car that can be competitive enough to fight for race wins, and then it's more or less down to (me)." 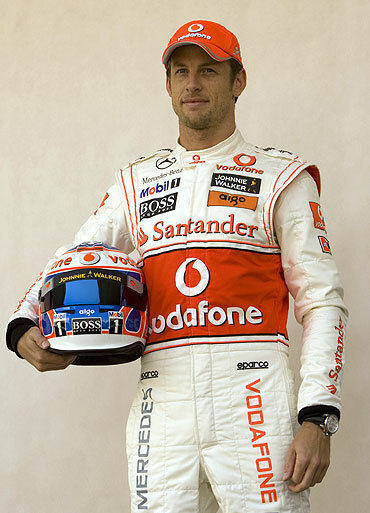 Button's bid for a podium finish this year in Melbourne will start in daylight and end in twilight, something the Briton handled with aplomb last year despite complaints from drivers and his own personal misgivings about safety. "It sounds petty, but it's not. It can be dangerous if you've got the sun in your eyes and you can't see where you're going." "But I'd rather be racing in the day, even a twilight race for me, I'd rather that than the night-time. "Out in front's probably not such a bad place to be (as the sun sets), so hopefully we can put ourselves in the same place and won't have to worry."